"This recipe was translated for me from a recipe I got from a Hungarian restaurant in Idar Oberstein, Germany in 1972. I've been making it ever since! Serve over wide egg noodles. Delicious!" Heat the vegetable oil in a skillet over medium heat. Stir in the onion; cook and stir until the onion has softened and turned translucent, about 5 minutes. Add the green peppers and tomato paste. Cover, reduce heat to low, and simmer for 10 minutes. Add beef to skillet, then stir in the cayenne pepper, paprika, garlic, salt, broth, lemon juice and caraway seeds. Simmer until the meat is tender, about 1 to 1 1/2 hours. Remove the goulash from the heat and let it cool slightly. Fold in the sour cream and adjust the seasoning to taste. 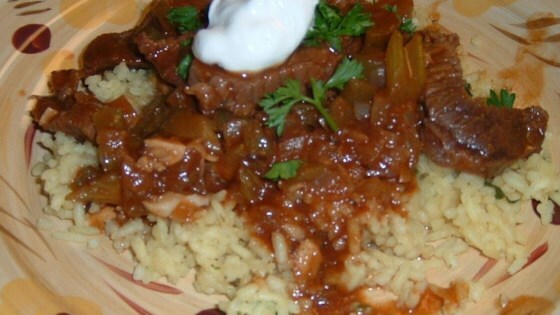 See how to make authentic, comforting Hungarian beef goulash. You may also use 5 cups of broth and 1 cup of white wine. I substituted filtered bacon grease for the vegetable oil. It was "wunderbar" (wonderful). To make it even more authentic, you could render German bacon (speck). This recipe needs some spicing up. It's a bit bland and takes a long time for the results. I thought there were too many green peppers. They overwhelm the dish. This dish is LECKER! My kids and husband loved it. Not a bad soup, but not like the Gulaschsuppe I remember from living in Germany. More like a tomatoey beef stew. Great recipe...I cut back on some of the liquid to make it thicker. I've made this about 5 times & I love it!